Looking for things to do in Siesta Key? 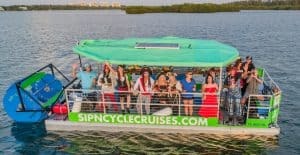 Outdoor activities abound, but only Sip-N-Cycle Cruises offers you boat rentals that combine light exercise, drinks and conversation, and stunning views of Siesta Key’s natural splendor. 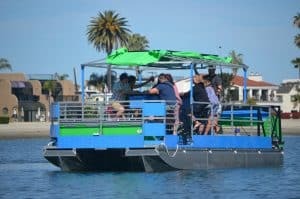 Our boat tours allow you and your friends, family, or coworkers to board our 31 foot-long catamaran, sit down at one of our ten pedal stations, and cycle in order to power our large paddlewheel which propels the boat through Siesta Key’s lovely waters! The cycling is the type of light exertion which allows you to burn off energy but still enjoy drinks around our mahogany bar, and take in the gorgeous sights and sounds of our gorgeous natural environment. 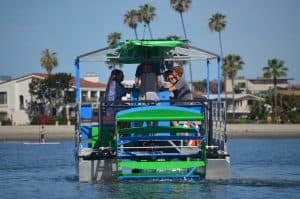 16 passengers can board at any given time, with 10 passengers cycling, making Sip-N-Cycle perfect for bachelor and bachelorette parties, team building exercises, birthdays, girls’ nights out, and corporate events. Our boat cruises are family-friendly, perfect for multiple families who would like to enjoy a day out on the water. If you don’t have 16 passengers in your group, meet new friends aboard our boat cruise, sharing memories as you cycle and spin your way through our beautiful waters. Our captain will ensure everyone’s safety and enjoyment throughout the cruise. Your group can board at Pop’s Sunset Grill in Nokomis, or at Bayfront Excursions in Siesta Key. You may purchase beer or wine at either of these locations, and we provide the coolers and ice for your drinks on-board. Take one of our private charters for a spin for a sunrise cruise or a sunset cruise for the most striking of views. Pedal your way through a paradise where you may even catch a glimpse of dolphins swimming alongside your boat! 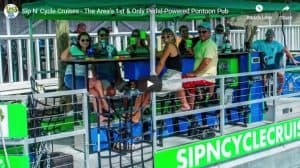 Sip-N-Cycle’s boat cruises are one of Siesta Key’s most unique and unforgettable attractions. 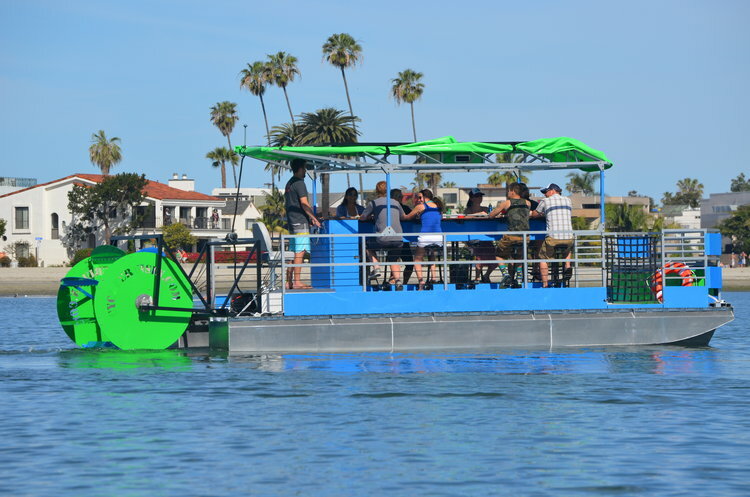 If you’re looking for activities on the water that you and your friends, family, or colleagues will talk about for years, book one of our cycle/spin cruises today!